Premier in Madrid at the theater Reina Victoria of the play "A Cat on a hot tin roof". Tennesse Williams' famous play, that made him win a Pulitzer Prize, is now represented in Madrid under the production of Jose Velasco, president of Zebra Productions. Amelia Ochandiano directs this text, also adapted to the big screen by Richard Brooks Paul Newman and Elizabeth Taylor like protagonists. 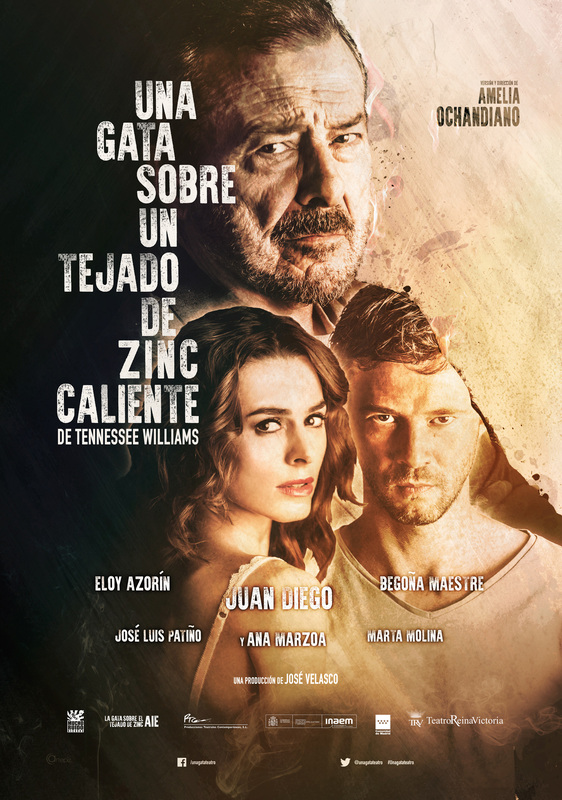 Eloy Azorin and Begoña Maestre give life to these characters with Juan Diego. The cast is completed by Jose Luis Patiño, Marta Molina and Ana Marzoa. The play of the renowned American writer sees the light under a new prism. This version, presented by the author, talks about universal themes as family, passion, disease, ambition, addiction, Love and especially the lack of love. Synopsis: The family gathers to celebrate aging patriarch Dad’s birthday. But there is more to this gathering than a family reunion, Dad is dying of cancer, and he hasn’t decided which of his sons will inherit the estate. His options include favorite son Brick, who drinks himself into oblivion in order to bear his past or his oldest son Gooper with his fertile wife Mae, and their six children. While sensuous, Maggie “the cat” tries to work her wiles to secure a future for them, Brick spirals deeper into despair, crippled by both physical pain and emotional loss.